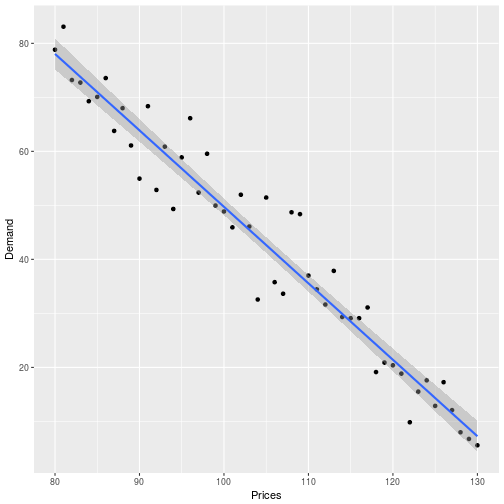 In the previous post about pricing optimization (link here), we discussed a little about linear demand and how to estimate optimal prices in that case. 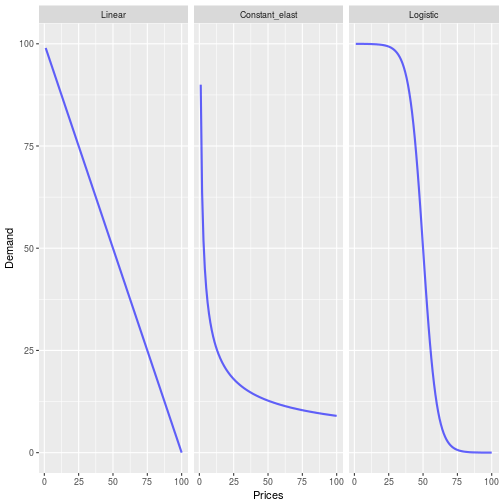 In this post we are going to compare three different types of demand models for homogeneous products and how to find optimal prices for each one of them. where is a scale factor and measures price sensitivity. We also can observe as the inflection point of the demand. Some books changes the signs of the coefficients using the assumption that is a positive constant and using a minus sign in front of it. However, it does not change the estimation procedure or final result, it is just a matter of convenience. Here, we expect to be negative in the three models. 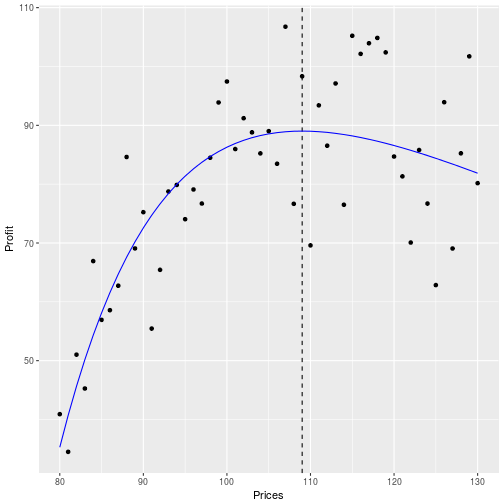 Of course that in practice prices does not change between 1 and 100, but the idea is to show the main differences in the shape of the models. All the models presented above have positive and negative points. 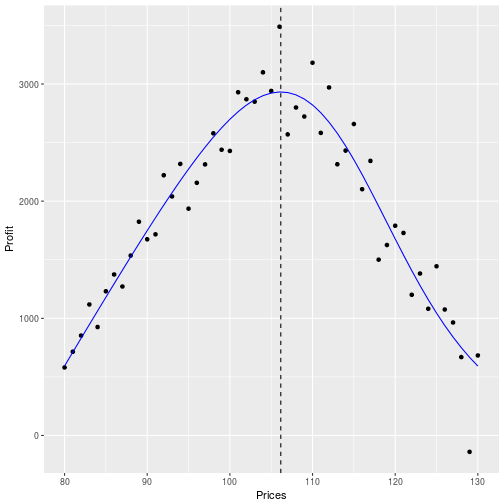 Although local linear approximation may be reasonable for small changes in prices, sometimes this assumption is too strong and does not capture the correct sensitivity of bigger price changes. In the constant elasticity model, even though it is a non-linear relationship between demand and price, the constant elasticity assumption might be too restrictive. Moreover, it tends to over estimate the demand for lower and bigger prices. In a fist moment, I would venture to say that the logistic function is the most robust and realistic among the three types. which is the famous condition that in the optimal price, marginal cost equals marginal revenue. Next, let’s see how to calculate the optimum prices for each demand functions. It is interesting to note that one needs , otherwise the profit function will be convex with respect to price and the optimal price will be . If one have a monopolistic market, normally this assumption holds. I hope you liked the examples. In the next post we will discuss about choice models, which are demand models when products are heterogeneous. Goodbye and good luck! Since the optimal prices is a non-linear transformation of the demand parameters, the methodology above could lead to sub-optimal prices due to Jensen’s inequality. 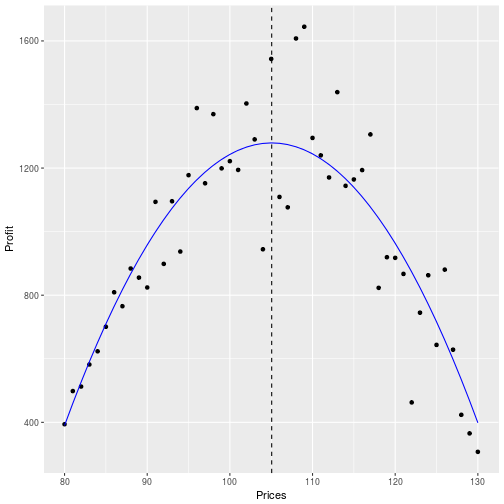 We are going to address this problem in another post with examples of how to estimate optimal prices when we have a lot of uncertainty in the demand function parameters. Phillips, Robert Lewis. Pricing and revenue optimization. Stanford University Press, 2005. 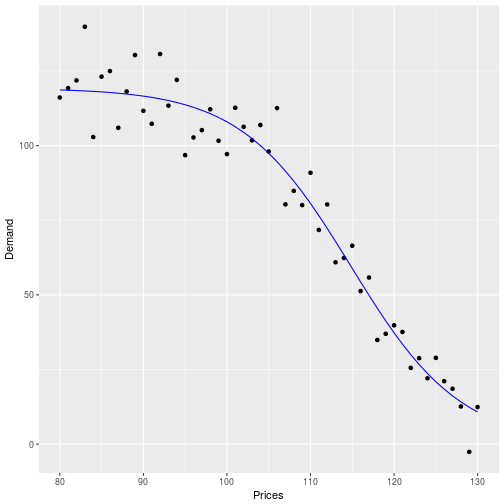 This entry was posted in R and tagged Demand, insightr, optimal price, Pricing, R, R blog. Bookmark the permalink. 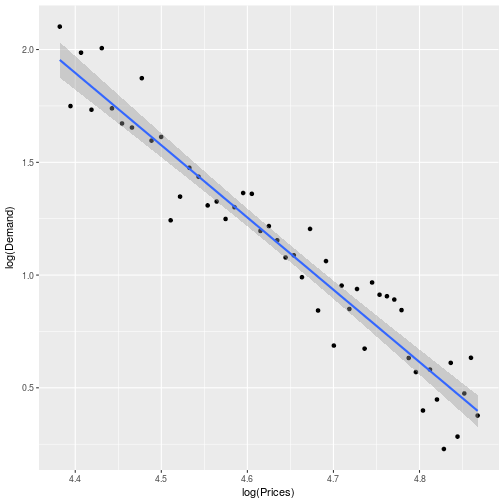 1) Aravindakshan/Ratchford (2011) show how to analytically solve for optimal prices and shares in logit-type models (https://doi.org/10.2202/1546-5616.1120). 2) You plug point estimates of the parameters in the equations for p*. However, because of the uncertainty in the estimates and the fact that p* is a nonlinear transformation of the parameters, this can lead to sub-optimal results. A simple solution would be a parametric bootstrap. Thank you for the comment! Really nice paper, I am going to take a look. About the second remark, you are absolutely correct. Jensen’s inequality gives us sub-optimal resuts. I did not address the problem this time otherwise the post could get too big. Definitely we are going to write a post about this issue e show some alternatives. Can you kindly clarify why the demand_objective = function(par, p, d) is calculated as “sum((d – logistic(p, par, par, par))^2)”, what’s the rationale behind this? I am trying to understand what the demand objective corresponds to in natural language. Thank you. I should have probably added, are you simply trying to minimise the squared error between a hypothetical demand function “d” and the logistic function that (best) fits d? Exactly Nad, you are correct. Sorry if it wasn’t clear. In fact, I should mention that the “benchmark” is not necessary a hypothetical demand function “d”. It is just demand observations. In this case, we are just guessing that these observations came from a logistic function and we are trying to find the best parameters to minimize the squared error. Another alternative is to use the closed formula from the paper that Daniel suggested in the comment above. About C the scale factor, is there any method to calculate or estimate the right value? Thanks for this great post. I was wondering if you were still planning to release a blog post on choice models with heterogeneous products and associated costs. Thanks! I dont understand the way that you simplify the logistic demand function. The inlfection point shoud be -B/a? How you put the p0 in demand equation?